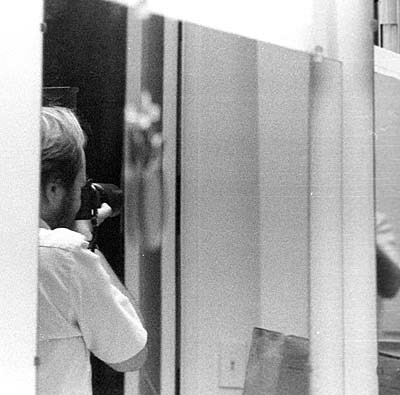 These are some long-lost pictures I found on a half-exposed, undeveloped roll of film. 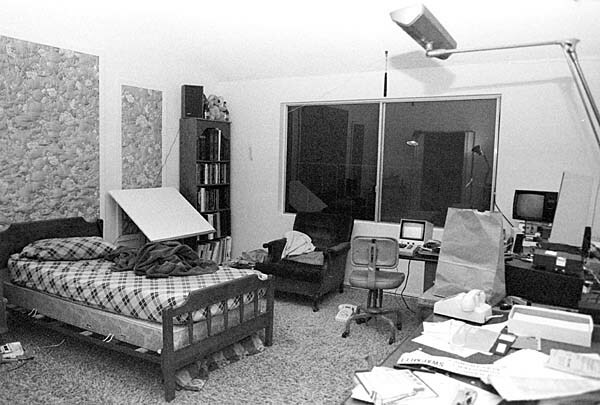 This is what my room looked like, circa late 1985 I think. This is when I was renting a room in the house at 6583 Edmonton. I'm standing in the office area, looking toward the bathroom. This was originally the master suite of the house, so it had a huge bathroom. You can make out the cabinets under the two sinks, and some of the mirrors. Note also the very high ceiling in the bedroom (not visible). It was high and sloping with the pitch of the roof. To the left of the bathroom door, note the 3x3 foot bookshelves. These were (and are) bright yellow, painted by Dad for Ellen I think. On top is the obligatory unabridged dictionary. On the floor in front is my camera case, a Zero Halliburton case that I still have but no longer use because the foam disintegrated. 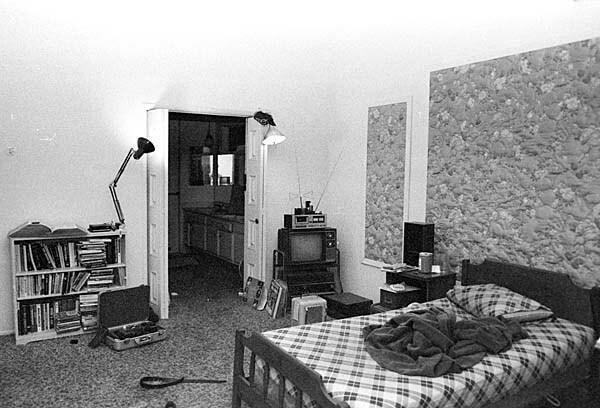 On the floor at the right of the bathroom door are some LP's, an electric space heater, and my Dual turntable. On top of the TV is a cassette deck. Below the TV is the Sony quadraphonic receiver handed down from Ellen. On the end table (whose was that?) you see one of the quad's speakers, a jar of Skippy peanut butter with a knife on top, a well-loved Doc Smith space opera novel being re-read, and the card file I got for debate but was (and am) using for QSL cards. On the wall to the right are upholstered fabric panels, original equipment with the room. The ugly sheets are Mother's fault. The bed also came from Orange. This is more or less the reverse angle. I'm standing roughly in front of the 3x3 bookcase. You can see my drafting table and a tall bookcase, both very cheap. On top of the bookcase you can see another speaker, a couple of empty bottles of Bailey's Irish Cream, and the teddy bear Carol gave me. The armchair is from Orange. In the armchair you can see my little "blue" blanket (which is still in daily use today) and a pillow Mother made (faux fur on one side, itchy brown upholstery fabric on the other). The chair from Martha's desk is in front of Ellen's desk, which holds my Commodore 64 with surplus monitor. The paper bag is on my workbench, made from a hollow-core door I got from Debbie when she graduated and moved to the real world, on 4x4 legs with galvanized L-brackets. The rest of the clutter on the bench is my ham radio gear. The tall off-white box is a speaker salvaged from another stereo from Orange (Martha's, I believe). Under the foreground clutter is Mark's desk, with Mark's fluorescent lamp. Yes, that's a 5.25" floppy disc (double-sided, double-density, holds 160K in the Commodore format). Notice the lack of window coverings. There were drapes when I moved in, but they were falling apart and surpassingly ugly (that is, they matched the wall panels). I took them down. The window didn't really need covering, since it was a second-story window and well-shielded by tree branches. The black thing hanging from the ceiling above the center of the window is my Rice tassel. And this is what my left rear quarter looked like in the bathroom mirrors. Some of my ham radio gear. The main piece was pretty new then, but was sold off years ago to help pay for its replacement. The item on top of it (a radioteletype modem) is in the closet, having been superseded by units with built-in CPUs. 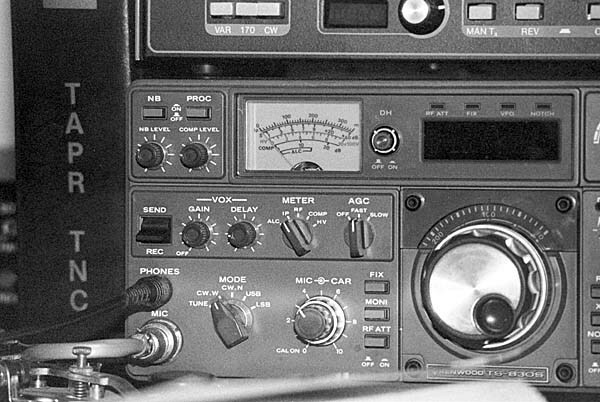 The book labeled "TAPR TNC" is the owner's manual for the very first-generation production controller for amateur packet radio. It stands for Tucson Amateur Packet Radio (the name of the group that produced it) Terminal Node Controller. I still have the book and the unit, but they are museum pieces now. The funny-looking mechanical bits in front of the book are a morse code key. Here's a picture of something I constructed. It's a serial port for the VIC-20/Commodore 64. Those machines usually used a software implementation of a serial port, which was very slow and not very reliable at "high" speeds of 1200 bits/second or higher. This board featured a hardware UART, which enabled the Commodore machines to go much faster with less effort -- but wasn't supported by any software but my own. 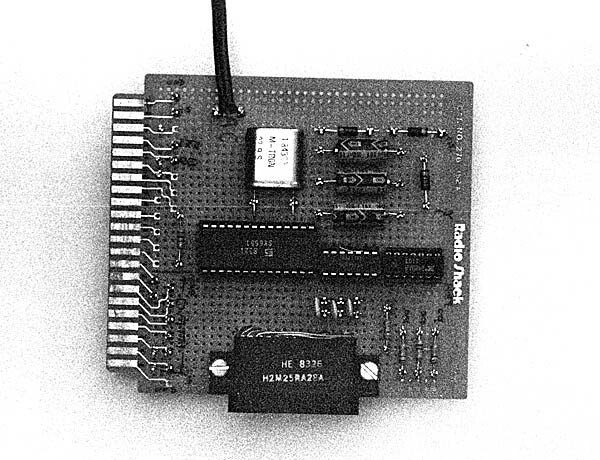 This gadget was constructed on a Radio Shack prototype board, designed specifically to fit into the game cartridge slot of the VIC-20 or C64. That's it for memory lane. All the other pictures on the roll were even more boring.